4" closed. 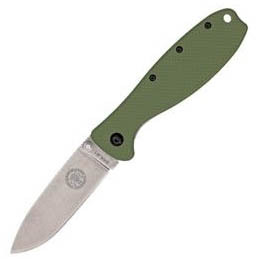 3" stonewash finish AUS-8A stainless blade with dual thumb studs and thumb ridge. OD green glass filled nylon front handle. Stonewash finish stainless back handle. Lanyard hole. Reversible matte finish stainless pocket clip. Designed by Randall's Adventure and Training. (The word Zancudo is Spanish for Mosquito).